The bumbling leadership of the Association of Zoos and Aquariums, the main accrediting body for zoological institutions, has outdone itself. You may remember last year’s conference, at which AZA CEO Dan Ashe invited and gave a glowing introduction to Wayne Pacelle of the anti-zoo group Humane Society of the United States. 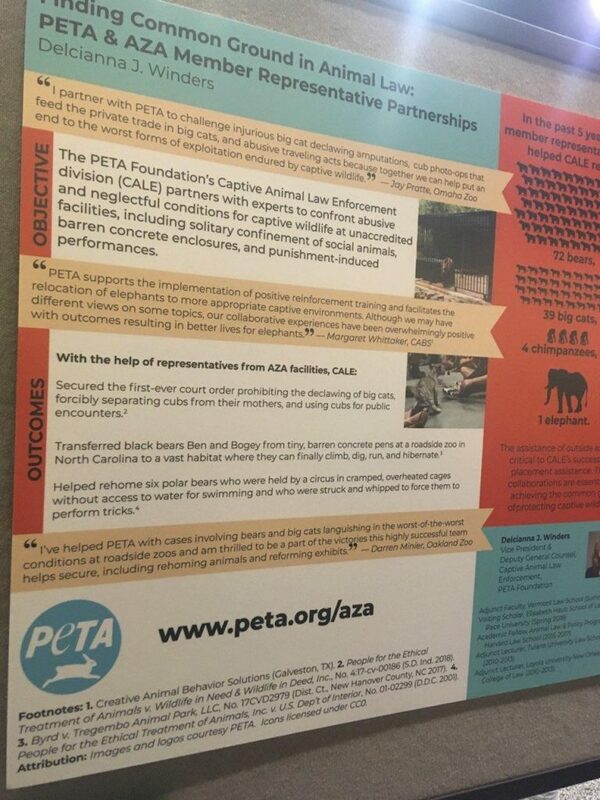 Now this year, AZA is allowing PETA—which calls zoos and aquariums “prisons” for animals—space to set up a poster booth. Our understanding is that AZA pre-approved PETA’s poster and the PETA web page it links to. The display is little more than a deceptive PETA olive branch encouraging staff members at zoos to reach out to PETA—a Trojan Horse. There is as much common ground between PETA and zoos as there is between the NAACP and the KKK. One would think Dan Ashe, head of AZA, would have felt a little embarrassed after he spent so much of his personal credibility on giving Wayne Pacelle a platform at AZA’s function last year—over the objection of many AZA members—only for Pacelle to resign a few months after he was credibly accused by multiple women of being a sexual predator. Since then, Ashe has been busy slapping his name on political op-eds on issues that have nothing to do with zoos, such as gun control. We figured Ashe was just a dunce—but this latest embarrassment indicates he is in bed with anti-zoo activists who want to undermine the institutions he is supposed to represent.